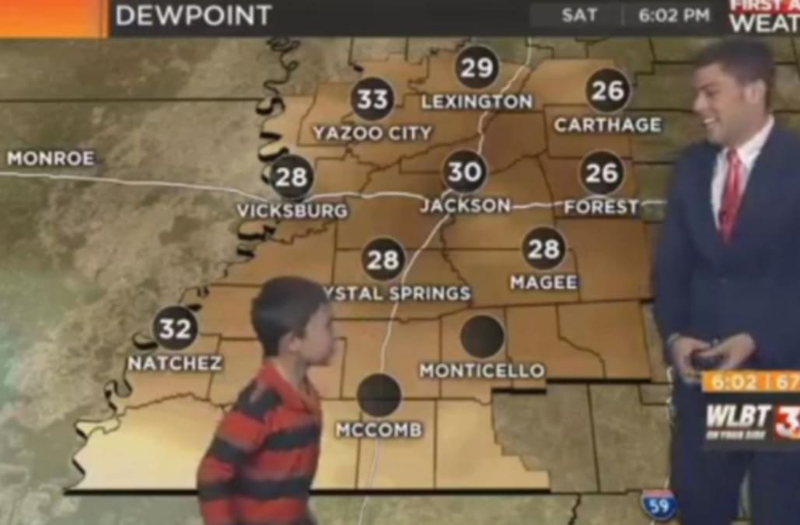 A Mississippi meteorologist got an unexpected gust of wind when a boy interrupted a recent forecast to fart on him. The stunt occurred on Saturday, as WLBT weatherman Patrick Ellis was trying to explain to viewers what kind of weather they could expect over the weekend. Just as he was about to launch into his segment, an excited child stormed onto the screen making crow noises. Ellis, visibly perplexed, didn't order the kid off air. "We've got a little bit of, uh, interesting things going on," he said while still trying to do his job. That's when the boy walked over to Ellis and apparently farted in his direction. "There are farts everywhere and toots — it's crazy," exclaimed the boy, clearly pleased with himself. A man then swooped in to carry the troublemaker away. Ellis took to Facebook shortly following the incident to explain how the kid, named Houston, got on the air in the first place. Turns out he's the son of a local lawyer who was invited on the newscast as a guest. "This Saturday was a little different," Ellis said. "This Saturday our friend Houston decided to he wanted to be on television." As for who yanked Houston off set — that was his father, Ellis shared.